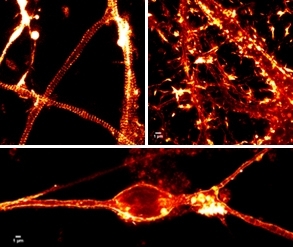 Actin is an integral part of the neuronal cytoskeleton as it is involved in the regulation of neuronal polarization, cell morphology, the development of neuronal processes (i.e., growth cones with lamellipodial and filopodial extensions and dendritic spines), intracellular trafficking, and synaptic plasticity (dynamic changes in dendritic spine number and/or morphology)1-3. Actin’s presence in growth cones and dendritic spines have garnered the attention of scientists for decades; however, actin is also found in neuronal axons, though its presence there has been described as the “black sheep of the neuronal actin family”4. This is because the exact details of actin’s structure and role in the axon are unknown. Recently, significant advances have been made in unraveling the structure of axonal actin with the discovery of the periodic membrane skeleton (PMS) by nanoscopic microscopy5 (Fig. 1). This newsletter discusses the discovery, structure, and possible functions of the PMS in axons. Discovered in 2013, the PMS is a type of cortical actin and the primary component of the actin cortex, a mixture of F-actin and actin binding proteins which supports eukaryotic cells’ plasma membrane and membrane-associated processes such as endo- and exocytosis and cell motility4,5. In neuronal axons, including the initial segment6, the PMS consists of short actin filaments bundled into evenly spaced rings that wrap around the circumference of the axon with a periodicity of 180-190 nanometers5-9 (Fig. 1). The short filaments are stabilized by an adducin cap which controls the diameter of actin rings and axons, as well as actin filament growth within the rings6,10. Adjacent actin rings are secured through cross-linkage by spectrin tetramers (bII in the axon proper and bIV in the axon initial segment)6,8,11. Figure 1. Live cell imaging in neurons with STED microscopy and 100 nM SiR-actin. Upper left: Hippocampal rat neuron, 8 DIV. Upper right: Hippocampal rat neuron, 17 DIV. Bottom image: Rat cerebellar granule neuron, 21 DIV. All images courtesy of Elisa D'Este, MPI Biophysical Chemistry, Göttingen. The PMS was described for the first time in fixed mammalian neurons and brain tissue slices using stochastic optical reconstruction microscopy (STORM)5. Shortly thereafter, these findings were confirmed by others using STORM, stimulated emission depletion [STED] nanoscopy, and structured illumination microscopy [SIM] in fixed mammalian and non-mammalian neurons5,6,8,11,12, and most importantly, living mammalian neurons using either the F-actin live cell imaging probe SiR-actin7,10,13 (silicon rhodamine actin; Fig. 1) or exogenous expression of fluorescently-labeled bII spectrin8. In cultured mammalian neurons, the PMS is established in the first few days of development in the axon proximal to the cell body before moving distally along the axon as the neuron develops5,7,8,11. In Drosophila primary neurons, development of the PMS begins within hours of plating11. Notably, the authors reported differences between the PMS of very young (hours to 2 days old) vs mature (>3 days old) Drosophila neurons. For instance, the PMS in young, growing axons, but not older axons, depends upon actin polymerization (i.e., nucleation factors)11. The actin binding proteins involved in nucleation, assembly, and maintenance of the actin rings are relatively unknown. In Drosophila neurons, two nucleation factors, Arp2/3 and formin DAAM [disheveled-associated activator of morphogenesis], participate in PMS formation, likely nucleating the multiple short filaments that comprise the PMS11. Neuronal axons are the means by which neurons communicate and transport cargo anterogradely and retrogradely between the cell body and axon terminal. Maintaining healthy axons is necessary for normal brain function as axonal loss is permanent and underlies both normal aging deficits and various neurodegenerative disorders and diseases14. Functionally, the PMS has been hypothesized to serve as a scaffold for the axonal plasma membrane; spatially organize molecules important for axonal structure and action potential generation, such as ankyrin and sodium channels, respectively, into a periodic distribution in axons5,8; assist in the docking of motor-associated cargo vesicles, especially along the distal part of the axon4,9,15; and organize transmembrane proteins along the axon11,15-18. 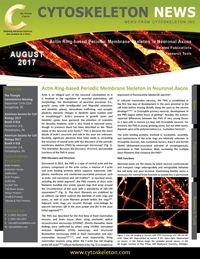 Actual functional data are sparse; however, a recent report using Drosophila primary neurons fixed and stained with SiR-actin concluded that the PMS is important in maintaining axon integrity by stimulating the polymerization of axonal microtubules (MTs), another primary cytoskeletal component of axons11. Cytochalasin D-induced PMS disassembly resulted in breaks in MT bundles, reduced MT polymerization, and reduced axon numbers11. Other MT-associated functional roles for PMS might involve assembling MTs into bundles19-21; serving as anchors for the minus end of MTs22,23; and supporting dynein-mediated sliding of MTs and transport24. The recent discovery of actin rings that comprise a sub-membranous lattice in neuronal axons offers an exciting opportunity to better understand the role of axonal actin. Moreover, actin rings have also been described in the nodes of Ranvier in the peripheral nervous system and in at least some dendrites and dendritic spines7,25. Similar to actin rings, actin waves and trails are other actin structures that have received little attention4. Without super-resolution microscopy (e.g., STORM, STED, SIM) and the development of live cell imaging probes such as SiR-actin, the existence and composition of the PMS would remain undiscovered. To help scientists further discover and define the composition, assembly, maintenance, and function of actin and other cytoskeletal structures, Cytoskeleton, Inc., provides SiR live cell imaging probes for F-actin, microtubules, DNA, and lysosomes, along with Acti-stain phalloidins for use in fixed cells. Luo L. 2002. Actin cytoskeleton regulation in neuronal morphogenesis and structural plasticity. Annu. Rev. Cell Dev. Biol. 18, 601-635. Cingolani L.A. and Goda Y. 2008. Actin in action: The interplay between the actin cytoskeleton and synaptic efficacy. Nat. Rev. Neurosci. 9, 344-356. Stiess M. and Bradke F. 2011. Neuronal polarization: The cytoskeleton leads the way. Dev. Neurobiol. 71, 430-444. Roy S. 2016. Waves, rings, and trails: The scenic landscape of axonal actin. J. Cell Biol. 212, 131-134. Xu K. et al. 2013. Actin, spectrin, and associated proteins form a periodic cytoskeletal structure in axons. Science. 339, 452-456. Leterrier C. et al. 2015. Nanoscale architecture of the axon initial segment reveals an organized and robust scaffold. Cell Rep. 13, 2781-2793. D’Este E. et al. 2015. STED nanoscopy reveals the ubiquity of subcortical cytoskeleton periodicity in living neurons. Cell Rep. 10, 1246-1251. Zhong G. et al. 2014. Developmental mechanism of the periodic membrane skeleton in axons. eLife. 3, e04581. Leite S.C. and Sousa M.M. 2016. The neuronal and actin commitment: Why do neurons need rings? Cytoskeleton. 73, 424-434. Leite S.C. et al. 2016. The actin-binding protein a-adducin is required for maintaining axon diameter. Cell Rep. 15, 490-498. Qu Y. et al. 2017. Periodic actin structures in neuronal axons are required to maintain microtubules. Mol. Biol. Cell. 28, 296-308. He J. et al. 2016. Prevalent presence of periodic actin-spectrin-based membrane skeleton in a broad range of neuronal cell types and animal species. Proc. Natl. Acad. Sci. U.S.A. 113, 6029-6034. Lukinavicius G. et al. 2014. Fluorogenic probes for live-cell imaging of the cytoskeleton. Nat. Methods. 11, 731-733. Adalbert R. and Coleman M.P. 2012. Axon pathology in age-related neurodegenerative disorders. Neuropathol. Appl. Neurobiol. 39, 90-108. Gallo G. 2013. More than one ring to bind them all: Recent insights into the structure of the axon. Dev. Neurobiol. 73, 799-805. Zhang Y. et al. 2016. Axon membrane skeleton structure is optimized for coordinated sodium propagation. arXiv.1602.06348. Albrecht D. et al. 2016. Nanoscopic compartmentalization of membrane protein motion at the axon initial segment. J. Cell Biol. 215, 37-46. Machnicka B. et al. 2014. Spectrins: a structural platform for stabilization and activation of membrane channels, receptors and transporters. Biochim. Biophys. Acta. 1838, 620-634. Prokop A. et al. 2013. Using fly genetics to dissect the cytoskeletal machinery of neurons during axonal growth and maintenance. J. Cell Sci. 126, 2331-2341. Sanchez-Soriano N. et al. 2009. Mouse ACF7 and Drosophila Short stop modulate filopodia formation and microtubule organization during neuronal growth. J. Cell Sci. 122, 2534-2542. Alves-Silva J. et al. 2012. Spectraplakins promote microtubule-mediated axonal growth by functioning as structural microtubule-associated proteins and EB1-dependent +TIPs (tip interaction proteins). J. Neurosci. 32, 9143-9158. Nashchekin D. et al. 2016. Patronin/Shot cortical foci assemble the noncentrosomal microtubule array that specifies the Drosophila anterior-posterior axis. Dev. Cell. 38, 61-72. Ning W. et al. 2016. The CAMSAP3-ACF7 complex couples noncentrosomal microtubules with actin filaments to coordinate their dynamics. Dev. Cell. 39, 61-74. Myers K.A. et al. 2006. Microtubule transport in the axon: Re-thinking a potential role for the actin cytoskeleton. Neuroscientist. 12, 107-118. Bar J. et al. 2016. Periodic F-actin structures shape the neck of dendritic spines. Sci. Rep. 6, 37136. Shi Y. et al. 2012. PTEN at a glance. J. Cell Sci. 125, 4687–4692. Lee J.O. et al. 1999. Crystal structure of the PTEN tumor suppressor: Implications for its phosphoinositide phosphatase activity and membrane association. Cell. 99, 323-324. Song M.S. et al. 2012. The functions and regulation of the PTEN tumor suppressor. Nat. Rev. Mol. Cell Biol. 13, 283-296. Al-Khouri A.M. et al. 2005. Cooperative phosphorylation of the tumor suppressor phosphatase tensin homologye (PTEN) by casein kinases and glycogen synthase kinase 3beta. J. Biol. Chem. 280, 35195-35202. Torres J. and Pulido R. 2001. The tumor suppresspr PTEN is phosphorylated by the protein kinase CK2 at its C terminus. Implications for PTEN stability to proteasome-mediated degradation. J. Biol. Chem. 276, 993-998. Rahdar M. et al. 2009. A phosphorylation-dependent intramolecular interaction regulates the membrane association and activity of the tumor suppressor PTEN. Proc. Natl. Acad. Sci. USA. 106, 480-485. Yim E.K. et al. 2009. Rak functions as a tumor suppressor by regulating PTEN protein stability and function. Cancer Cell. 15, 304-314. Maddika S. et al. 2011. WWP2 is an E3 ubiquitin ligase for PTEN. Nat. Cell Biol. 13, 728-733. Li Z. et al. 2005. Regulation of PTEN by Rho small GTPases. Nat. Cell Biol. 7, 399-404. Trotman L.C. et al. 2007. Ubiquitination regulates PTEN nuclear import and tumor suppression. Cell. 128, 141-156. González-Santamaría J. et al. 2012. Regulation of the tumor suppressor PTEN by SUMO. Cell Death Dis. 3, e393. Huang J. et al. 2012. SUMO1 modification of PTEN regulates tumorigenesis by controlling its association with the plasma membrane. Nat. Commun. 3, 911. Bassi C. et al. 2013. Nuclear PTEN controls DNA repair and sensitivity to genotoxic stress. Science. 341, 395-399. Okumura K. et al. 2006. PCAF modulates PTEN activity. J. Biol. Chem. 281, 26562-26568. Ikenoue T. et al. 2008. PTEN acetylation modulates its interaction with PDZ domain. Cancer Res. 68, 6908-6912. Cho S.H. et al. 2004. Redox regulation of PTEN and protein tyrosine phosphatases in H2O2-mediated cell signaling. FEBS Lett. 560, 7-13. Cao J. et al. 2009. Prdx1 inhibits tumorigenesis via regulating PTEN/AKT activity. EMBO J. 28, 1505-1517. Horita H. et al. 2017. Identifying regulatory posttranslational modifications of PD-L1: A focus on monoubiquitinaton. Neoplasia. 19, 346-353. Xu W. et al. 2014. Posttranslational regulation of phosphatase and tensin homolog (PTEN) and its functional impact on cancer behaviors. Drug Des. Devel. Ther. 8, 1745-1751.